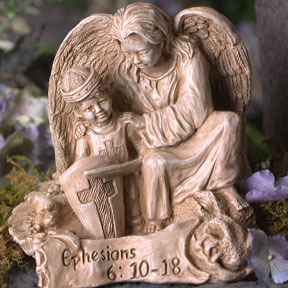 Home > God's Word Sculptures > Ephesians 6:10-18 "The whole armor of God"
the readiness that comes from the gospel of peace. which you can extinguish all the flaming arrows of the evil one. be alert and always keep on praying for all saints. Though he thinks I’m too afraid I will still attack. Even if no blow is struck it’s presence makes him flee. Gives to me my Fathers thoughts and renews my mind. I’ll keep my shield of faith, my vision being true. It has helped me many times with dragons I have slew. my loins are girded up with truth, not swayed by enemies. and it is through His righteousness that I am set apart. This is where my army comes down from ‘round the throne. beating wings, and grand valor to fight this dark outcast. Our King assures the outcome we fight in His great name! I loved sculpting this piece. 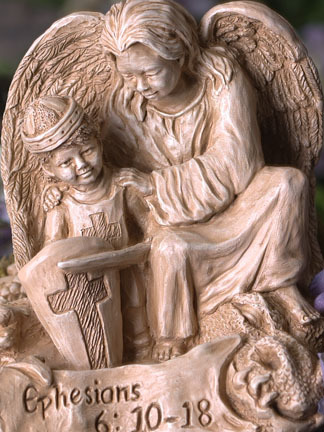 I have often been asked, “Would you ever sculpt a gargoyle or a dragon?” My reply was always, “Only if an angel was sitting on his head.” So for a very long time, in my heart and mind was this angel sitting on the dragon’s head squishing his eye. I have tried to sculpt the little boy with armor several times, but something was always missing. It was Halloween, I was in the studio and it came to me. Within that evening I had roughed in this piece. I love it when things like this happen; it is truly divine inspiration. Let’s focus on the suit of armor that this young knight has on. As you read through the scripture you will find that each piece has its place and purpose. To give a full study on this scripture would take too much space. Allow me touch on some of the things that stand out for me. It is not by our own strength that we fight those things in our lives or in this world but we can be strong in the Lord and the power of His might. I try to keep all parts of my armor on and in check; it is not always easy but I know that ...when the day of evil comes I can stand my ground. Sometimes you feel like you have done everything you can do, of your own might and through God. Notice what He says, when you have done everything, to stand. Keep standing knowing your King and His promises. And on a final note, personally I also believe there is great power in prayer. Somehow the angels of heaven rally around us to help with our fight, as this angel has done for Dustin. So as you are standing, don’t forget to pray. I am very excited about this piece and its corresponding poem. Thank you so much for loving it as I do. Help us to keep our armor intact, and to know our King and His promises. When we are tired, help us to stand, and dear Lord I ask for the protection of Your angels.